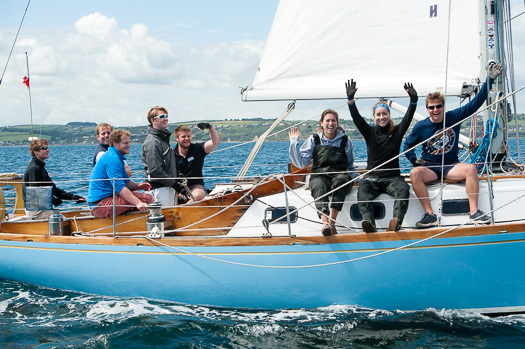 #corkweek – Crosshaven sparkled both on and off the water yesterday as all is in readiness for the official start of racing today at Volvo Cork Week 2014 writes Claire Bateman. The aura of goodwill and smiling faces was in evidence everywhere in Crosshaven today. The Royal Cork Yacht Club was buzzing with last minute registrations of yachts still arriving, the sun shone non stop and there was a delightful summer breeze wafting around to keep the crews on the water. Many of the yachts, particularly the visitors, took the opportunity to make an observance trip of the harbour both inside and out while others decided to take part in the practice races organized by the Race Committee and to iron out an last minute glitches in their final preparations. Make no mistake, it is all very pleasant and amicable with a wonderful spirit of camaraderie but, just like any other sport, once the start is underway the competition comes into play. With a good forecast for today of some 11 to 16 knots of nor westerly breeze conditions should be perfect for the in harbour race that takes the yachts up to a turning mark of Cobh and is a favourite viewing point with the general public. Given the forecast, the yachts may yet get to experience what is known as the "cathedral puff" a wind that may get deflected around the spire with sometimes interesting results! It only remains to wish the best of luck to all competitors for a wonderful week of racing and to enjoy the extensive shoreside facilities organized for the week.